What you can expect when you visit Saint Anselm’s is a friendly face to greet you and provide you with a worship booklet. Everything you need to participate will be right there in the booklet, so settle into a pew and make yourself at home. Please take your booklet home with you as it contains announcements and information about Saint Anselm's. For information regarding specific sacraments (Baptisms, Confirmations, Weddings and Funerals) please see below and free to contact the Parish Office at 631.744.7730. Anointing for Healing is offered at all services on the last weekend of the month. Private Confession is by appointment. Baptism is the sacrament of initiation into the Body of Christ. By the pouring of water and the invocation of the Holy Trinity, the human person becomes one with Christ, a temple of the Holy Spirit, a child of God, a member of the Church. Baptisms are celebrated at Saint Anselm's on the Feast of the Baptism of the Lord, on Easter Sunday and Pentecost Sunday. The sacrament may also be celebrated at other times through the year by arrangement with the Parish Office. Baptisms are not celebrated during the season of Lent. Preparation for the celebration begins by reading the documents available below, then completing the inquiry form and/or phoning/emailing the Parish Office. Preparation includes a meeting of parents, and godparents as possible, with the Rector and a workshop with Saint Anselm's Baptismal Ministry group. It is a great joy to welcome new members into the Body of Christ. 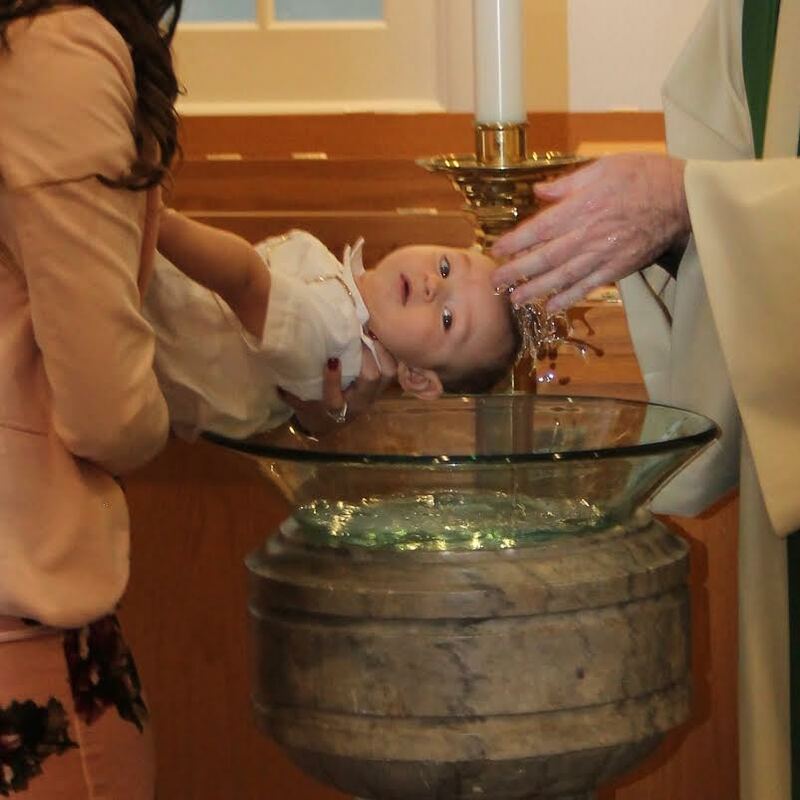 Have you shared the joy of welcoming a new life into the Body of Christ here at Saint Anselm’s at a baptism? This is one of the best moments in the life of a family and in the life of the whole church. It is time for us to deepen and enrich the experience of families asking for the baptism of their children. Every eight weeks we will have a baptismal preparation meeting for families planning to baptize, whether their child is already born or on the way. This single session will include knowledge about the church’s understanding of Baptism through the years, but also an invitation to enter together into the great gift this sacrament proclaims and shares. Since Baptism brings us entry into the community of Christ, it is right that the community walk with the families as they prepare. Would you be interested in becoming part of our baptismal preparation team? We need grandparents, recent parents who have baptized a child within these recent years, and big brothers and sisters of baptismal babies. Training will be provided. Our first experience with families will be in preparation for Eastertide. Since we will meet every other month from then on, no ‘heavy lifting’ is required, just a love of Christ, the Church, family, and babies. If you want to know more, email or talk to Father John (jmcginty@stanselmsofshoreham.org). We will plan an initial exploratory meeting between now and Ash Wednesday. Thank you for considering this invitation! All the baptized are welcome to receive the Eucharist, to be strengthened for life by the reception of the body and blood of Christ. Parents may decide to have their child receive the Eucharist as soon as their son or daughter evidences a desire to do so. Feel free to consult with the Rector, if helpful, as you make this decision. Other parents decide to wait until their child is older, 7 years old, to receive the Eucharist for the first time. Each year, in springtime, Saint Anselm's provides a several week preparation for those children who will receive first communion together. Family and friends are invited to join the first communicants at a Sunday parish celebration of the Eucharist at which the parish community can rejoice with you in this great gift. Call or email the Parish Office to inquire about first communion. It is a tradition of the Church to invite those who have been baptized to confirm their faith as they grow toward human maturity. Saint Anselm's affords the opportunity each year to our young people - and those who have not previously been confirmed - to seek Confirmation in the Church. At the beginning of each calendar year, those interested are invited to commit to a program of preparation for the eventual celebration of Confirmation with one of our Bishops. Call or email the Parish Office for more information.